I am constantly at battle with my body and my mind. Never, ever comfortable in my own skin. Even when I lost 60 pounds, I felt like a fraud. People said to me, “You look fabulous! Keep up the good work!” And I thought… So, did all those years of being overweight mean I was bad? I couldn’t hear their compliments because I twisted and gnawed on them until the bitter was all I could taste. Physically, I felt good when I was lighter. And this little clawing creature in the back of my brain said: This is unsustainable. You cannot make this last. The minute I started to gain the weight back, the silence of my friends and family was deafening. No one said, “You look great! Keep it up!” And I heard what they were truly saying through the void. I heard their disappointment and their disapproval, even if they didn’t hear it themselves. That silence fed my deepest fears — that I was only worthy of approval when the numbers were decreasing. It is heartbreaking to hear what my food choices have done to others. I wanted it to be a private, secret place. But it never is. There is a desperate selfishness in those who cannot make peace with their own bodies. My mom had to lie awake at night worrying. Chris, too. I understand that now because I see my own daughter pulling her shirt down over her bottom, looking at herself in the mirror and asking, “Do these jeans make me look fat?” And my answer is always — always — inadequate. Ultimately, I say too much, gushing about how beautiful and perfect she is. I know that to her young ears, it probably sounds hollow and insincere. She hears so many different messages in this world. Most of them say to her, “You are perfect when you are this size. You will fit in when you can wear this.” I don’t want her to hear those messages, but she will. We all do. 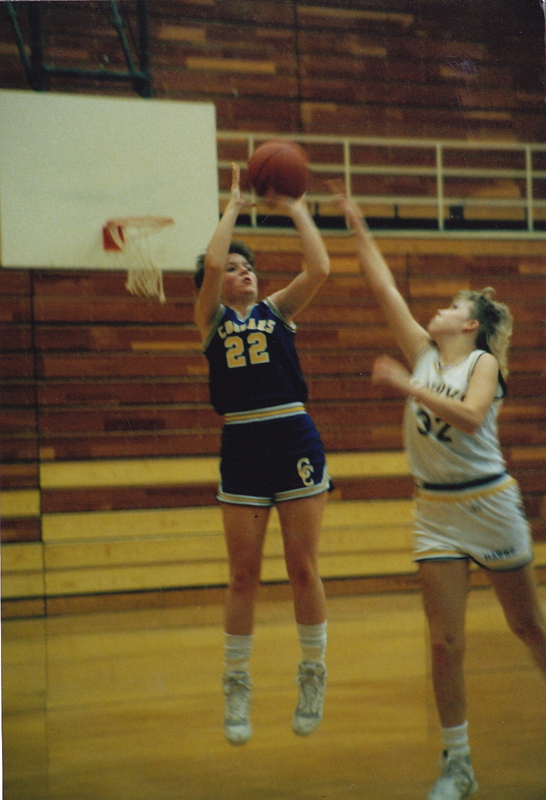 My high school basketball coach — when I was 16, fit and strong and healthy — said to me offhandedly, “You’d be so much faster if you lost 20 pounds.” It became my life’s mantra. It was my fill-in-the-blank script. You’d be so much ______ if you lost 20 pounds. Prettier, faster, healthier, more attractive, smarter, more worthy. If you lost 20 pounds, you’d be enough. I have spent my life trying to be what someone else thought I should be. I have wasted much time equating my worth with my weight. I have lamented the amount of space I take up on this earth. Too much, too much… the voice in my head whispers. There is no blame in what I’ve experienced except that which resides within me. This is my issue, my cross, fueled by what I chose — and choose — to see and believe about myself. The voids in our lives manifest themselves in many ways. Some drink to fill them. Some exercise. Some work themselves into an early grave. Some hoard money and things. For me, it’s all about food. It’s about stuffing myself until I’m sick. It used to be about throwing it all back up, watching it flush away. Now, I just sit with it. It spreads out from my stomach and my hips, this ugliness and insecurity. It is always with me. Having an eating disorder is not a switch that can be turned on or off. A doctor (not my own) once said within earshot, “I don’t understand why it’s so hard to lose weight. You just shut your mouth.” Another said to me, “This is a phase. You will grow out of it.” Both were callous, insensitive statements. I understand that truth now. I didn’t at 16. Those statements were yet another way for me to beat myself up about who I was… and who I wasn’t. About what I was able to control… and what controlled me. I know in my heart and my head what I should choose to eat. I know how much I should weigh. I know how to get there. I know when I sit down with a bowl of ice cream that, more often than not, I shouldn’t. And it’s an internal struggle… every time. But I also know that ice cream is just a substitute for something else, something that needs to be filled. Something that only I can grant myself. Acceptance? Grace? Forgiveness? Even today, in conversations about being overweight, my well-meaning friends say, “Don’t you worry about what kind of example you’re setting for your daughter?” And my answer is this: Yes. YES. I worry every second of every day about how my dysfunctional relationship with food affects me, my daughter, my sons, my family. Every. Single. Second. I have an adoring husband who loves me exactly as I am. By all external measures, it should be enough, I know… this unconditional love. But the key is in learning to love myself wholly. This is an internal job. Chris says to me, “You are beautiful. You are perfect. You are everything I’ve ever wanted.” And I snap back at him, “Look at these thighs! Look at this stomach! Look at these chubby cheeks! You are enabling me with your love.” That’s the kind of circular logic my brain concocts. He cannot win. His love cannot save me from myself. That conversation is a rabbit hole for him. But how much worse is it for those who feel completely unloved and under-appreciated? For those who never hear words of kindness and compassion? I have been loved so well and so completely in my lifetime. My heart splits for those who must go it alone. Bulimia has rendered me a different person physically, even though my most prominent battles with it ended over twenty years ago. The damage that’s been done to my body becomes evident as I age. After years of being addicted to laxatives, my digestive system doesn’t work correctly. My teeth are cracking and breaking, the enamel long ago destroyed. My metabolism has been altered, and I fight anxiety and depression on the daily. This is not a disease I would wish on anyone. It is a silent, private shame. It is a selfish, singular state of being. I hate being fat, and I am uncomfortable being thin. My skin — with its stretch marks and sag — feels foreign. I try not to look at it. I am 99.9% better today than I was 20 years ago, but I will never be “cured.” Why? Because bingeing and purging is always an option. Laxatives are readily available. And food is necessary for survival. If my ultimate goal is to lose weight, I know how to do it. I can get there. And I can distinctly recall that rush of endorphins that comes from bingeing and purging. It is always hidden, tucked away… my secret stash of self-preservation, my easy path to a fleeting and flimsy measure of success. Why am I talking about eating disorders? Because they are prevalent and pervasive. And they are devastating. We need to change the conversation, to create a new and different reality for future generations. My friends and I discussed Ex-Lax and Dexatrim in locker rooms, in dorm rooms, in sorority suites. We need to make sure there are other discussions happening as well. I have spoken with my 13-year-old daughter about eating disorders, about food, about healthy choices. I want her to know there is a soft place to land when her friends begin the discussions… or continue them. I want her to know that I’ve been there, that she doesn’t have to go. Such pressure exists for our young people to achieve a level of perceived perfection. Get good grades, participate in extra-curriculars, achieve a societal standard of physical acceptance, run yourself ragged trying. Here’s what I’d like for our kids to hear instead: Do your best, work hard, be kind, give back, help those less fortunate, make healthy choices, embrace what makes you different and unique, focus out. Those with body image issues will still pick and choose what sticks, but if they hear it enough, perhaps some day it will sink in and become part of a more positive, more constructive internal dialogue. Here’s what we need to say to our children, to our friends, to our family members, to our fellow human beings: I love you. You’re powerful. You make me smile. You make a difference. Over 30 million Americans will deal with an eating disorder in their lifetime. To learn more, visit the National Eating Disorders Awareness site. This entry was posted in Me Myself And I and tagged basketball, bingeing and purging, bulimia, cooking, Dexatrim, eating, eating disorders, Ex Lax, laxatives, National Eating Disorders Awareness, self worth, self-acceptance, worthiness. Bookmark the permalink. Katrina, this post really rattled me. I too dealt with an eating disorder… and still battle it every day. I no longer binge and purge, or starve myself and exercise like crazy… but the horrible messages I tell myself are still there. I almost never look in a mirror and like what I see. You could have written this about me. Thank you so much for your courage and honesty. It touches me. I would love to share this with students but because of the “f” word I cannot…is there anyway to eliminate that word as this story needs to shared! Sadly we hear too many of those messages that make us obsess about appearance, whether it’s weight, skin, hair, etc. Thanks for sharing– I read many lines that were said to me growing up– never meant to be unkind, but nevertheless, hurtful and insensitive. I read this while not well equipped to comment, but wanted to return now that I’m awake and upright. When I moved to Los Angeles for my first year of law school, I went from being average weight to well outside the normal weight. Suddenly it was impossible for me to not notice this thing I’d barely given thought to before. I made it my mission to lose weight, and did a fabulous job . . . from the outside. My classmates commented how good I was looking, and I strove harder to be a better and better fit for this image of beauty. I thought I was doing it right until I went home and my friends asked if I was sick. No one said, “You look great! Keep it up!” And I heard what they were truly saying through the void. This was my experience as I tried to balance Los Angeles perceptions with my childhood Oregon ones. It was a struggle, and it pains me it’s a struggle others still endure today, right now. At all these doctor visits where the doctors/nurses pick apart weight, I think, “Do you know how badly these casually flung words of judgment could damage someone who’s struggling?” Maybe next time I should ask it. Not only are your blog posts beautiful, but your comments are, too! Thanks for sharing your Los Angeles story so eloquently. It’s funny — I often feel there are certain places I shouldn’t live or visit because/when I am overweight. I think living in LA would be tough. This is a great post. I found you through Tales from the Motherland. I’ve never had an eating disorder myself, but have obsessed at times about my weight. I remember distinctly, a day when all four of my kids were young. I over heard my youngest run into the next room and say, “Guess what I just saw Mom doing! Eating a cookie!” The shock of the other kids resonated in my ears. I decided then that my kids would see me eating desserts, and I would be more careful about what I said about my size. I also like what you said about comments from others about weight loss. I’ve never been one compliment someone on losing weight, even when it’s obvious. Because I’ve never wanted anyone to think I only like them if they are skinny. I’ve always wondered if that was the right decision, sometimes getting that “look” from them that suggested I was supposed to say something about their weight loss. It’s the first time I’ve ever had it confirmed by someone who really knows and feels it, that maybe that’s the right thing to do. Many of my favorite people in this world are over weight, and I just don’t care. So thanks for this wonderful piece that has helped those of us who have not lived an eating disorder, understand it better. Cheers to you! This is beautiful and heart-wrenching. I’m coming over from Dawna’s site as well and I’m so glad I did. This post brought me to tears several times. Your words are so true and so powerful. My relationship with food is so unhealthy and I’ve never really been able to fix it. I know where it comes from, how it started, but that doesn’t matter. I know how to help myself, but I don’t. Now that I have my son, I want to even more. My husband is the same, always telling me I’m beautiful. I love him for that, but until I find comfort in my own skin, his words go along unaccepted and under appreciated. This message is so important and I love what you said at the end. Thanks for sharing. What a brave post! Thank you for sharing your struggles…it is so hard to appreciate what others are going through, but you have done an incredible job of describing the eating disorder struggle here. It may be a matter of degrees, but these feelings of never being enough have got to be the most pervasive challenge faced by people in North America. You mention that evil five-lettered word “shame” as one of the causes of your suffering…this is something I’m working on and would like to share this resource – “Healing the Shame that Binds You” by John Bradshaw has opened my eyes to where the shame originated and also how to heal it. Powerful stuff. Go to the source of your pain…the rest is just Band-Aid treatment. Wishing you peace in this difficult journey. Thanks, my friend. And I agree — I think so many of us always feel “not quite enough.” Thanks for the book recommendation. Sending you lots of love and joy! Katrina, this was heart-wrenching. Thank you so much for your courage and openness. I have never had an eating disorder per se, but I have struggled with my body image my whole life (at 16 my dad used to inform me that I would never find anyone who would marry me because of my weight – I was maybe 10 pounds over weight at the time). Anyway, since you mentioned repeatedly that you knew you used food to fill a hole, I wanted to recommend a book I read years ago that really helped me: “The Weigh-Down Diet”. It’s not a diet, but a book on how to STOP dieting and listen to yourself inside – it helps discover what it is we are hungry for and to distinguish between hunger for food and hunger for other things. I know there are tons of books out there purporting to help this problem, and I don’t want to push you to anything you aren’t interested in. I just thought of the book as I read your story. Take care and God bless! I found your story from Hands Free Mama. I have struggled for years with body image issues. My mother never ate growing up…she was always on a diet. My grandma called herself fat and she weighed 105 pounds….so even at 120 pounds I always thought I was fat. I never went so far as to have an eating disorder, but food was an issue for a long time. My biggest thing was hating my face. I could not stand to look in the mirror or have pictures taken. I would RUN FROM THE ROOM if someone was getting on Skype. It was when my 6 year old daughter said, “I dont like myself” that I realized I was passing this self hate on…. I found a friend who does Emotional Freedom Technique and after 3 sessions with her I have released all of the negative tapes that had run through my head since I was 8. Three decades of negative chatter is gone. It isnt easy, but it is worth it. My 6 year old now says, “I love myself” and it is nothing I ever talked to her about….it was just what she absorbed from me now that I love myself. I tell you this because I honestly think everyone can benefit from the therapy that changed my life. You can look on my blog under EFT and read about my story if you ware interested. It was the best $500 I ever spent. Your bravery, your honesty, they humble me. At some point I know I will speak publicly of my bulimia. I hope I can do it as eloquently and honestly as you. This is EXACTLY how I feel. Thanks for being brave enough to share. What a powerful post. I came here from Hands Free Mama. While I have not personally dealt with eating disorders, I’ve definitely dealt with addiction, weight issues and the never-ending quest to fill holes with all sorts of destructive behaviors, even though they are holes that honestly cannot be filled. I recently had the insane pleasure of watching my senior daughter perform in her school production of “Little Shop of Horrors.” After the show, I asked a friend to snap a photo of us—me, her and her dad—and when I looked at the shot, I felt sad that I looked as chubby as I did. Instead of just focusing on the absolute joy of being in the presence of this amazing, beautiful child of mine, I focused on wishing I took up less space. I’m tired of thinking ________ would be better if I weighed less. Have you heard Christina Perri’s song “I Believe”? There are so many struggles like eating disorders and addiction and depression that are never truly “cured” but require mindfulness –conscious consistent healing. This song is beautiful for that healing. Thank you, S. I just listened and fell in love with this song. These lyrics resonate deeply with me. Thank you for sharing. Music is my therapy. Wow. Just wow. Thank you for sharing something so personal and so scary. I suffer from other (mental well being) issues and talking about them, even with my closest friends, leaves me feeling vulnerable and foolish. Thank you for paving the way. Like several other women mentioned, this could be written about me. I identify with so many of the thoughts and issues you mentioned. And even though I know all these things about myself in the darkest places of my mind it’s illuminating to read them here from someone else. And I love that you have acknowledged that you will never be cured but you are better than you were. I have not done that and perhaps I should. I love your honesty. I want to write something that expresses the depth of my appreciation for your writing but words escape me. There is something amazing about someone who can tell their story so bluntly and make someone feel their struggle and their pain without ever having walked in their shoes. I haven’t ever suffered from an eating disorder, but I was always on the upper edge of normal weight-wise as a high school student. My closest friends were always just a little bit thinner than me, and I strived to lose those last few pounds so we could be equal. I have always been described as “solid” – even when I was 16 and had a flat stomach and trim thighs. Well now after having 3 kids in 3 years, “solid” would be a compliment at this point! I know exactly what you mean when you talk about the fact that you KNOW how to lose weight. It’s no mystery, we KNOW how it works. We’re not stupid. I know I shouldn’t eat that piece of birthday cake. I know I should go exercise. Just today I pledged to myself that I would get motivated to lose the last 15 pounds of baby weight. So I am sitting here drinking water instead of unwinding with that glass of wine I would rather be drinking. I don’t love the body I am in now, but I am not sure I would love a body that weighs 30 pounds less either if it means constant vigilance and restrictions. Thank you for your honest, unashamed words. 99.9% better. You go, girl. Well said and this post is going to resonate for awhile. What a struggle daily for me, even though like you said the throwing up has stopped years ago. I appreciate this post. I’m usually not someone that comments. I’ve felt many of your feelings. I went on my first diet at 7 and now am 25. I’ve found the Intuitive Eating by Evelyn Tribole and Elyse Resch book (they use the material at eating disorder clinics) to be very life changing in my journey. I know that it is hard to focus more on what the body can do. And the difference it can make than what it looks like…but Im gradually feeling a shift my thinking and it’s freeing. If you or your readers haven’t heard of them, Geneen Roth is helpful and so is “Intuitive Eating” by Tribole. Wow. I could have written this post. I am 28 now, just had my first baby. I had lost 40 lbs before coming pregnant and looked great. I am now 20 lbs heavier, post baby. All the old thoughts are back. Everything you have said. Thank you for making this post, really. Reading again because this showed up in my FB memories this morning. Still so very powerful.